Have you ever forgotten what your username is for a gaming portal? I have! I’ve registered for on a lot of gaming portals and it is always a hassle to find a username that isn’t already taken. And when I finally figure one out then I have a hard time remembering it if I come back a couple of months later. This is not unique for me. Many players go to one portal and play for a while then move on to another and then come back to the first portal weeks or months later. Then it isn’t easy to remember your login details. 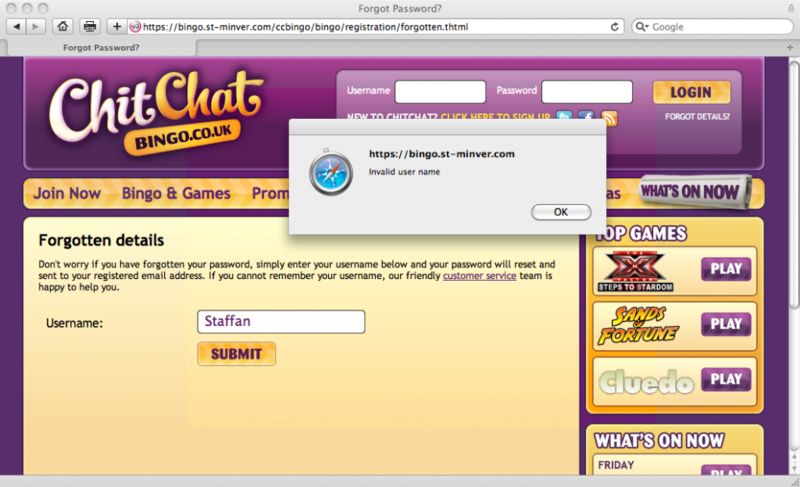 Today I was going to check out the new bingo client at chitchatbingo.com, I knew I had registered before so I tried to log in but couldn’t remember my username and password. I then click on the “Forgotten Password?” link thinking I could get the login details emailed to me. But as you can see in the image above I have to give them my username to get a new password. And I can’t remember my username. What do I do now? I try to click on the link “customer service” thinking I will get to talk to a person on live chat, but when I do all it does is reload the page. When a player is on your site ready to play you need to make it as easy as possible for her to start playing! The solution on chitchatbingo.com could be improved. I was ready to play, but couldn’t, now I am a lost customer.